Our online service allows you to order Goatsbridge Trout Products from the comfort of your home or office and have our products delivered to you at your convenience. We handle your order with the same great care and attention to quality and food safety as we would if you were to buy it in our farm shop. Your Goatsbridge trout is delivered in a cool poly box, packed in a dedicated cold room, and stored in a temperature controlled environment for delivery. Unfortunately delivery costs cannot be avoided but we are doing our best to accommodate them by offering Goatsbridge products ordered from our online shop at reduced prices. 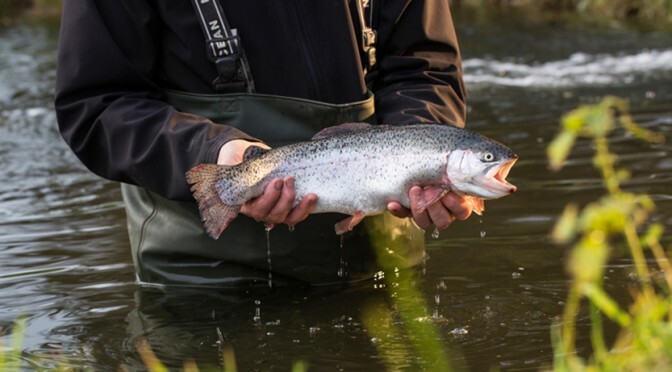 There is a flat rate for delivery in Ireland of Goatsbridge Trout of €10.00 per 20kg weight so if you are able to order in bulk for your freezer, please bare this in mind. If you order from our online shop, all orders over €100.00 to be delivered in Ireland will be free of charge. Online orders are only available in Ireland and Northern Ireland only. I’m Noémie from Agrilys Travel agency in France, I visited you in October with a french students group and our guide Jessie. I brought from your farm 5 canned smoked salmon and it is really delicious ! I bought 5 box and I do not have anymore … And we don’t have this type of products in France .. If possible I wish to place an order from France, is it possible ? Do you know the amount of delivery charges ? And how much do I have to buy to obtain free delivery charges ? I will try to mobilize to make a collective purchase order. Thanks very much in advance for you answer.